Spray foam insulation is a new type of material that can create an airtight seal in your attic to stop leaks from happening. With other types like fiberglass and cellulose, no matter how they fit into the spaces of your attic, there will still inevitably be gaps for air to escape. While it may only be a little bit at a time, it still adds up! Spray foam stops this issue completely, as it expands to fill up the area right up against the frame. Even if your attic has insulation that's in good shape already, replacing it with spray foam may still save you money in the long run! Thanks to reducing the gaps that allow air out unlike other types of insulation, more air will be trapped inside to circulate and regulate the temperature. This means your heater and air conditioner will run for less time, thus saving you on energy and money as well! If your energy costs are higher than you'd like them to be, and you notice the temperature of your home is inconsistent, getting spray foam installed can help both of these issues! It's important to have your spray foam insulation installed by a professional, as it requires a careful hand to be done properly. If it's sprayed too close to the frame, the foam can expand into it and cause it to splinter and break. If not enough is applied, then there may not be the desired seal, or the correct amount of R-Value required for the area. We'll take care of everything for you in no time! Our technicians will ensure that it's carefully put in so that none of these potential problems occur. You'll have an airtight attic before you know it and start reducing energy spending right away! What is the R value of spray foam insulation? The R-Value quantifies the effectiveness of the applied method of insulation by measuring its ability to prevent heat from escaping through the area in question. Closed-cell spray foam has the highest R-value of about 6, compared to other types that usually range between 3.2 and 3.8. The high value is a reflection of the composition of the foam – it is very dense and made of closed-cell floatation polyurethane of 2 to 3 pounds per cubic foot. This type of material also incorporates insulating gas or a blowing agent that further increases the R-value, the high resistance to water and the low moisture permeability. What are the pros and cons of spray foam Insulation? 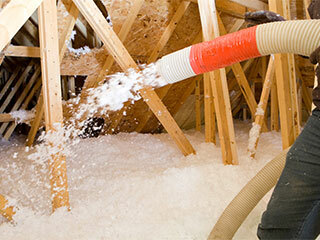 Spray foam insulation is made of two types of polyurethane and isocyanate. It is often the product of choice for exterior walls, attics and basements, and has many advantages – when the material expands it penetrates all gaps and holes making it airtight and therefore increases the energy efficiency of the building and reduces the high cost of heating and cooling. Similarly, it serves as an effective barrier to moisture and prevents the spread of mold. The main disadvantage is the cost involved. Therefore, when considering the use of this type of material, the property owner needs to look at the long-term savings – the house will be better insulated and more energy efficient for many years.